While the New Horizons spacecraft is still making its way to the frozen realms of Pluto and the Kuiper Belt, NASA's MESSENGER space probe has reached hot Mercury. The car-sized spacecraft zipped past Mercury in a Monday flyby and is relaying more than 1,200 new images and other data back to eager scientists on Earth. "Now it's time for the scientific payoff," MESSENGER principal investigator Sean Solomon of the Carnegie Institution of Washington told SPACE.com after the flyby. "It's just a complete mix of results that we're going to get." Being so close the the Sun makes it difficult for Earthbound astronomers to study Mercury. I remember being thought that Mercury had one hemisphere constantly facing the Sun. This was latter discovered to be completely incorrect, Mercury does in fact rotate with a 59 day Sol. Its still a world of mystery its denser then any other planet and there may be ice at the poles. 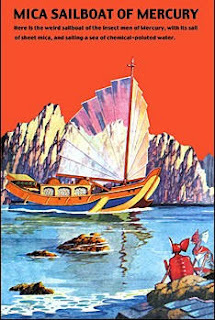 If there is water ice there may be a remote chance of finding some sort of life but I doubt if anyone will ever go sailing with the insect men of Mercury.